Last week I was host for a super fun event at Sugarhouse Casino in Philly. It was a great time with my mom blog friends! I love spending time with them. Yeah...blogging can be very isolating. Especially when you have your face in your computer all the time. So to get together in real life with the people that you know from your online life is always a treat! 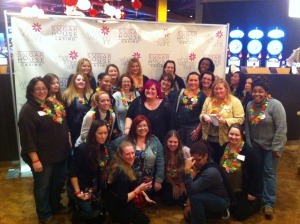 Fab Philly Mom Bloggers! (Nice Tebow in front row! lol)Ben FM & SugarHouse Casino also had some great guests! I know they surely didn't come out just to see me. Ahem. hahaha. They came to enjoy the island food, drink & steel drum fun! 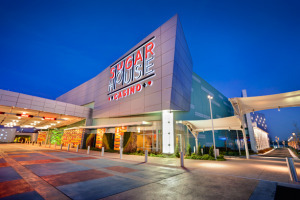 SugarHouse Casino is a great spot for a little night out fun! Their food is outstanding as is their impeccable service. There are great places to dine: The Refinery, Jacks Sandwich and Sweets and Lucky Red. Some great entertainment for Girls' Night Out too! Of course their daily happy hour, but also enjoy the Dance Party with Jerry Blavat, Eddie Bruce and SO much more! Here is a great video recap of the event. Let me know if you want to come out for one! We're gonna do many more with Ben FM!